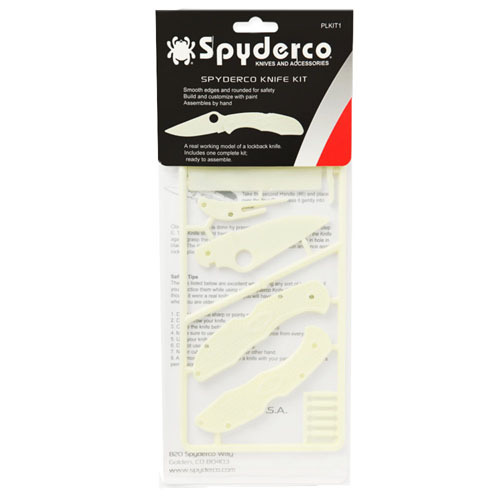 The Spyderco knife kit enables kids seven and up to build their very own folding knife. This is a great way for adults to teach youngsters about the function and safe handling of a folding knife without the safety concerns. The glow in the dark color of the kit can be customized with paints to give children the ability to make their knife kit look truly unique. This kit has everything you need to built your first model of a folding knife and requires no special tools nor glue. Kids will spend hours taking it apart, reassembling it and customizing it all the while leaning about the inner workings of this handy gadget. Kit even comes with credit card size ”business card” with all Spyderco's contact information for when they're ready for the real thing.